(or (A.T * b).T) because it's short. Which is more elegant is probably a matter of taste. 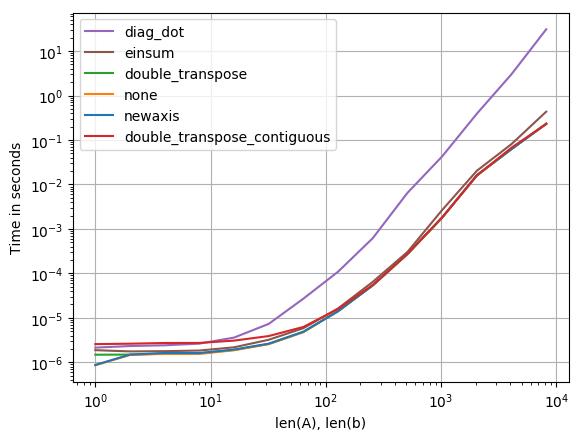 I'm proficient with the numpy broadcasting (newaxis), but I'm still finding my way around this new einsum tool. So I had play around a bit to find this solution. Incidentally, changing a i to j, np.einsum('ij,j->ij',A,b), produces the matrix that Alex does not want. And np.einsum('ji,j->ji',A,b) does, in effect, the double transpose. For those lost souls on google, using numpy.expand_dims then numpy.repeat will work, and will also work in higher dimensional cases (i.e. multiplying a shape (10, 12, 3) by a (10, 12)). Not the answer you're looking for? Browse other questions tagged python arrays numpy or ask your own question.